The demise of Upton in Yorkshire is obviously close to the heart of one of its favourite sons, playwright John Godber. The ill-fated 1984 Miners’ Strike, and the subsequent closure of the area’s pits, had a devastating effect on the town from which, more than 30 years later, it is still struggling to recover. Regeneration proposals come and go but feelings run deep and little has improved. Godber, who knows this better than anyone, is in London this week at the capital’s newest stage, the Marylebone Theatre, with his 68th play, Shafted! an achingly funny, thought-provoking two-hander that he performs with his wife, Jane Thornton. In a week when the Chinese have well and truly shafted Wales over their steel industry, the story couldn’t be more on the button. It doesn’t matter if it’s Port Talbot or Upton, they all face an uncertain future. 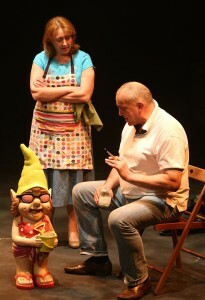 Godber and Thornton play bickering husband and wife, Harry and Dot, and the narrative takes us, in leaps and bounds, from the moment Harry is made redundant from the pit in ’84, through the bleak years as the couple struggle to make ends meet, to success “in the fast lane” and back again. It’s a clever and well-crafted story that, whether you agree or not with the political philosophy underpinning it, is beautifully told and packed with Godber’s lively wit. More than a story about redundancy, fortitude, mining or even Thatcher’s legacy, it is a tribute to marriage and a couple’s enduring love for each other. Standing at a garden gate Harry is a man crushed. He’s spent his life down the mines and now, with a paltry £18,000 redundancy, he faces an uncertain future. Over the next few years we see him try his hand at window-cleaning and emptying the bins but he becomes work-shy, depressed and wallowing in self-pity. Dot, who had always given him her support, becomes increasingly frustrated and angry at his lethargy. Nearly 30 years on and he’s harbouring a grudge and lamenting the closure of the pit, railing against Thatcher and holding onto a dream that one day he’ll return to the coal face. The ghost of Yosser Hughes from The Boys from the Blackstuff hangs in the air, along with the smell of cannabis that he’s starting smoking. His wife holds down two jobs to support them until, eventually she’s had enough of the one-a-day rows and demands that they start anew in Bridlington, perhaps running a little B & B. “You can go if you bloody like but I’m not going! I have roots here!” he bellows. The clock later spins in reverse and we get the gaps in the story filled in. What happened next, sharing their life with 50-odd giant gnomes, finding contentment and facing heartache. The pair squabble throughout the play with heated exchanges that see her hopes and aspirations clash with his recalcitrance. She wants to move on. He can’t let go of the anger and resentment. Thornton wins our sympathy with her occasional monologues that expresses her pain at their struggle but I couldn’t help feeling that their life would have been so much easier if she’d come up with the Bridlington idea a decade earlier. 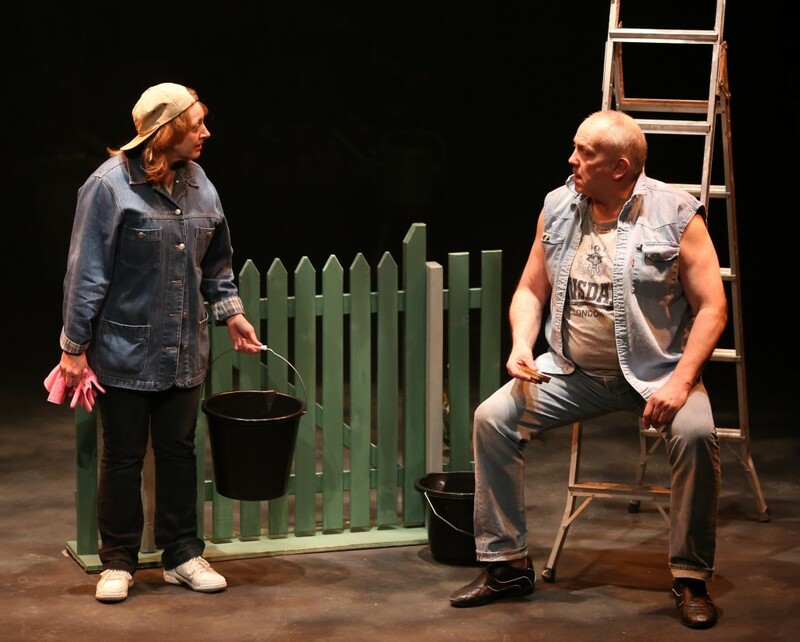 Godber’s superb performance clearly comes from the heart and it’s fuelled by an anger and bitterness over what happened to his town. But among his scathing sermonising are some beautifully funny marital retorts, the endless sniping very recognisable to those of us hitched for the duration. “We’re still together aren’t we?” He asks after one quarrel. Harry and Dot could be any couple that have made it through 50 years of marriage. You’ve got to wonder what, after everything, keeps them together, and it’s love. Shafted! runs at the Marylebone Theatre (a great little venue and one that I hope fringe producers will use) until tomorrow. Tickets are still available for tonight and tomorrow’s performances. It plays Northern Stage, Newcastle, April 12-16; Stephen Joseph Theatre, Scarborough, April 18-23. Playwright John Godber gives a heartfelt turn, alongside his wife Jane Thornton, in his 2015 beautifully crafted, achingly funny post-mining drama, Shafted!